Hour-long crime drama. Two episodes watched for review. Tench’s words could be the credo for Mindhunter, the new Netflix series depicting the dawn of criminal psychology and profiling, based on John E. Douglas’ true-crime book of the same name. (Ford is a fictionalized version of Douglas, and Tench is a stand-in for Douglas’ fellow special agent-turned-author Robert Ressler.) Although it was created by The Road screenwriter Joe Penhall, the project most prominently bears the creative fingerprints of David Fincher, who’s an executive producer (alongside, among others, Charlize Theron, who brought the project to Fincher’s attention) and directed the two episodes screened ahead of the show’s premiere. 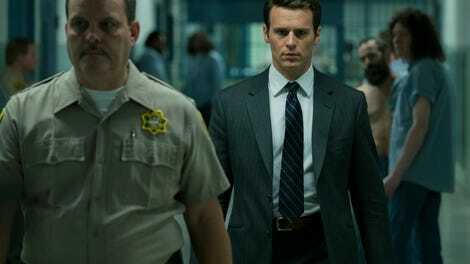 The moody atmosphere, the meticulous camerawork, the interest in the criminal mindset—Mindhunter’s opening salvo could be the Thomas Harris adaptation Fincher never got to direct, sourced from the guy Harris based Jack Crawford on. Like Bryan Fuller’s Hannibal, it’s a contemplative spin on the Criminal Minds model, a cerebral procedural of visually rich pulp. If it can do a better job of maintaining those Fincher flourishes than House Of Cards did—there, he only directed two episodes; he bookended the first season here—Mindhunter might turn out to be the next great Netflix drama. These origin-story elements lend a verve of curiosity to the first two hours of Mindhunter. It’s crucial, because so much else about these episodes is anti-verve. In pacing, in tone, even in the way Britton delivers his lines as Ed, these episodes mimic the methodical nature of assembling a profile. That’s where Fincher’s involvement feels crucial, the early goings of Mindhunter playing like an exploded-diagram version of big-screen, Fincher-directed procedurals like Seven, Zodiac, and Gone Girl. The show takes its time, whether it’s the tense hostage standoff that establishes Ford’s negotiation tactics or the jailhouse back-and-forth between agent and convict. (Placing Ed’s half of the conversation in the center of the frame, Fincher interrogates and acknowledges the irreconcilable magnetism of the serial killer, all the while calling back to a pivotal Zodiac scene.) It’s less cat-and-mouse than Mouse Trap, the pieces of its stylish Rube Goldberg contraption steadily accumulating on the board. The initial threads of potential season-long cases are tugged in brief intermissions from the Ford-Tench action; the series’ third lead, former Fringe star Anna Torv, waits in the wings during the two episodes provided to critics. It’s a hypnotic harmonizing of old and new, one that keeps the procedural framework intact while using the space between the story beats (and the notion that viewers might gulp down one episode after another) to dig into what makes its characters tick. Not since Hannibal has a TV crime thriller picked brains so well; Ford may share metatextual DNA with Jack Crawford, but the character’s age and Groff’s performance put him closer to Hugh Dancy’s anxious portrayal of Hannibal’s Will Graham. But he makes for a compelling central figure from the moment he strides into the series’ hostage-situation cold open, where his refusal of a bullet-proof vest and a megaphone speak loudly enough. 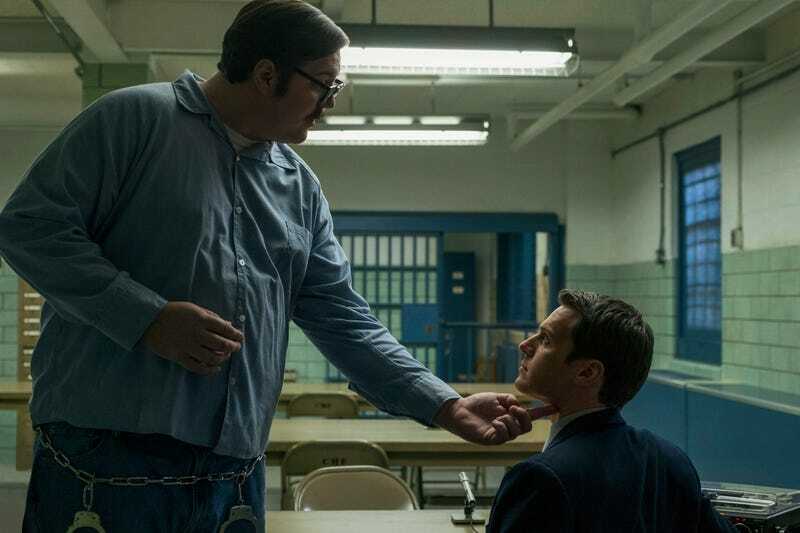 With all its extra elbow room, Mindhunter chooses to show rather than tell, creating a profile of its protagonist in idiosyncratic barroom banter and Groff’s boyish squirreliness. All that space benefits the show’s relationships, too, be they the romance taking root at that bar, the tense partnership between Ford and Tench, or the new partners’ dynamic with their stick-in-the-mud supervisor at Quantico. When Shepard sends his fractious, experimental branch of Behavioral Sciences to an out-of-the-way basement office, he becomes the Skinner to their Mulder and Scully, and you can feel the episodic drive of Mindhunter kicking into gear. On the surface, Mindhunter commits the sins of so many other stultifying, turgid products of the streaming age: It marinates in setup, it stubbornly refuses to tip its hand, it treats its story like Silly Putty that can be stretched and stretched and stretched across something that somebody, somewhere is going to label a “10-hour movie.” But everything enthralling about the first two episodes delves deeper and feels more alive than Netflix also-rans like Ozark and Gypsy, from Fincher leaving his signature on the Kemper interviews to the energetic subtleties of Groff’s performance. It’s in that understanding of the subject matter, too, the bone-deep attraction to what should otherwise repulse: the cultural preoccupation that keeps Investigation Discovery on the air and true-crime volumes like Mindhunter’s source material on bestsellers lists. From the looks of its early chapters, Mindhunter is equally invested in the psychology of its characters and viewers.